On an entirely different note, I want to talk about education. I’ve been teaching for ten years. I’ve been teaching in an urban public school for ten years. I’ve been whining lately about policy makers. They seem to be so far removed from the reality of education. The reality: the person (living, dedicated) sitting in a room full of children (real, not grown-up, also alive) teaching. The unreality: kindergarteners taking standardized tests? Students needing to improve every single time they take a test, or else they are failing and so is their school? I’ve been saying that the people who make educational policy should be educators. I recognize the disparity there. Educators are kind of busy educating. But let’s say I actually put my money where my mouth is. What if I wanted to work on educational policy issues? Maybe I’d start by going back to graduate school. Sounds good, right? So I looked at a couple of doctoral programs. Again, I’m not a rocket-scientest here, but the programs do not make sense. To learn how to make policy for education, one does not, apparently, need to learn anything about children. Hmmm. Ok. Wouldn’t it make sense, if one were going to spend millions of tax-dollars doling out standardized test money to George Bush’s test and textbook-selling cronies, that said person might be required to take, oh, I don’t know a CHILD DEVELOPMENT CLASS? Then maybe they might know that kindergarten-aged children cannot necessarily hold a pencil correctly, let alone complete a standardized test? They are far more concerned with which shoes their mom made them wear that morning, than a question on a paper? The classes in these programs are all about educational policy, politics, and leadership. But shouldn’t a leader know who they are leading? Many of these people trying to “reform” education blame teachers. Yet, they themselves have never stood in that room alone with twenty-two seven-year-olds. One of whom always has to go to the bathroom. One of whom just got back from three months in Bangladesh and has forgotten English a bit. One of whom smells a little funny. One of whom is very excited about playing with bits of paper on the rug. And one of whom always always has her hand up, but never quite has something to say that matches the topic at hand. I believe that every one of those kids has the ability to meet high standards. But how those standards are being measured and how my performance may be measured does not make a lot of sense. Just add this to your program. Not unlike the swim test I had to take before graduating from Brandeis, because swimming is just something a well-educated person should know how to do. Each doctoral candidate must substitute teach for one month in a public school. They must have no outside support beyond what the school provides them. Nobody at the school needs to know that they are anybody special. Just a sub. That is my idea for education reform. I think if every person trying to fix education would just dip their toes in teaching, education reform would shift from blaming teachers to supporting them. From testing children to nurturing them, you know, teaching them. Oh dear, don’t get me started. I guess one problem I’m having is figuring out how to go from what seems like a whiny teacher to somebody people might listen to. 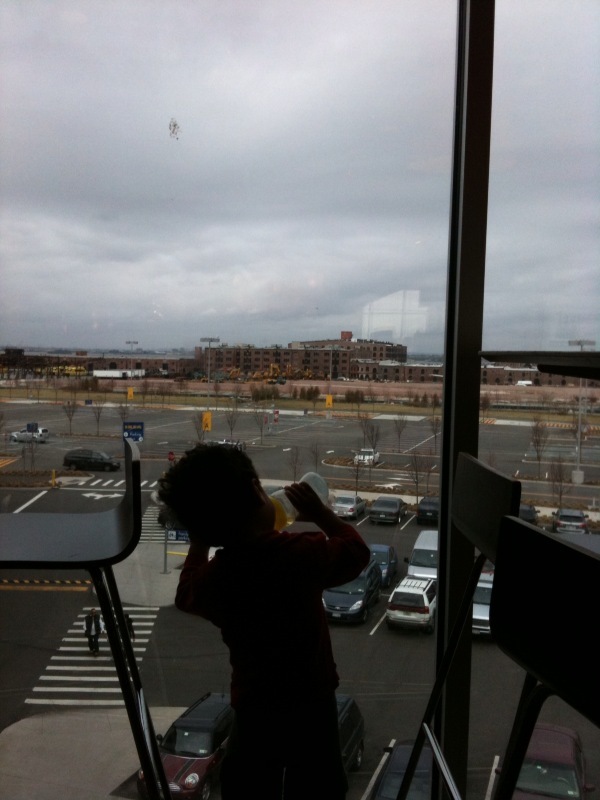 This blog is turning into a place for me to post pictures of my toddler looking at trucks. Fascinating, right? Well, if you can think of something helpful I could write, let me know. My “How-to” posts seem to get the most play. I love to be helpful, though I’m not much of an expert at anything except posting pictures of my toddler looking at trucks. My PT is so nice and funny. It is hard for me to picture her as a drill sargent. I went to my second PT appointment. This time I did not have my period. (Whew.) Of course that meant that she did have to do the internal exam. And she actually used the phrase “everything from the waist down” which sent TTC willies down my spine just from the memory of those early morning dates with Dr. Mug and his magic wand. Oye. So I have to do 30 Keegels a day. Prolapsing is scary. Scary I tell you. And I need to up my fiber intake because I need to never, er, strain, if you know what I mean. It makes me prolapse. Which is scary. I feel a little like an old lady. And I guess I am technically middle-aged for those who only intend to live to be 76. I have to do these four things to keep from straining: 1) Add oil to my diet. Olive oil on the salad. Check. 2) Eat more fiber. I bought some flax seeds. I just need to figure out how to grind them. My PT mixes Fiber 1 with Lucky Charms. See, I told you she’s nice and funny. She said the marshmallows make up for the Fiber 1 yuck. 3) Drink more water. I don’t need to do that. I already drink plenty. And 4) Exercise. Get this: the crunches I’ve been doing recently are not so good for me. They are similar to straining in a bad prolapsy way. So I don’t have to do crunches anymore! Woo! She’s going to teach me other stuff for my abs. She told me to do yoga. So I have to do yoga. She told me to. Now I really need to sit down and figure out how to go. And she’s friends with my prenatal yoga teacher. Hence, I love her. Boot camp is nice and cushy so far. I guess I should go do some Keegels now. Harumph.